GuardDuty analyzes and processes VPC flow log, AWS CloudTrail event log, and DNS log data sources. You don’t need to manually manage these data sources because the data is automatically leveraged and analyzed when you activate GuardDuty. For example, GuardDuty consumes VPC Flow Log events directly from the VPC Flow Logs feature through an independent and duplicative stream of flow logs. As a result, you don’t incur any operational burden on existing workloads. 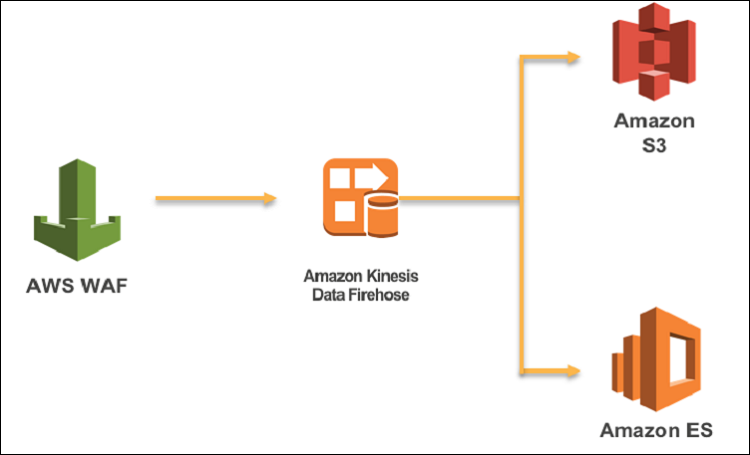 Amazon Kinesis Data Firehose. This service provides a way to load streaming data into data stores and analytics tools at any scale. 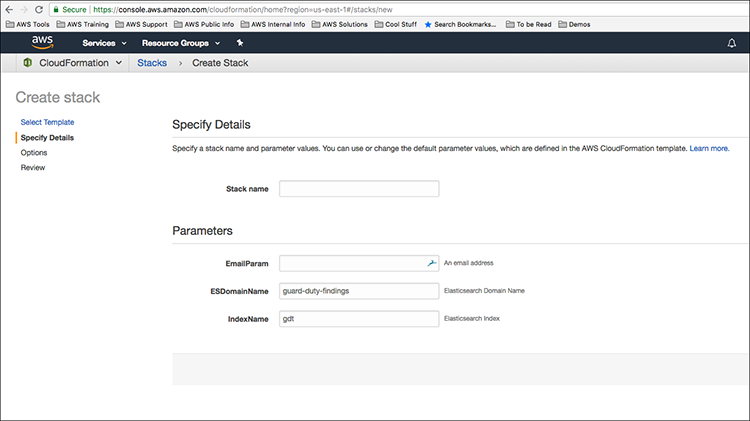 Amazon CloudWatch Events. 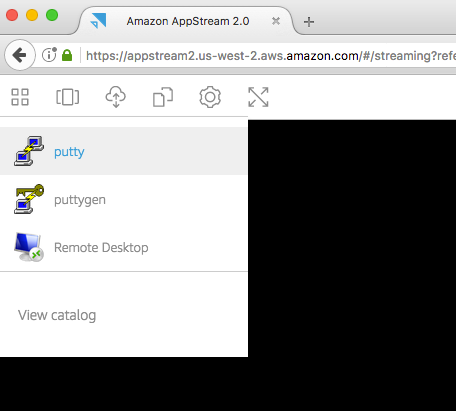 This delivers a near-real-time stream of system events that describe changes in AWS resources. Amazon Simple Notification Service. This is a web service that coordinates and manages the publishing of messages to subscribing endpoints or clients. Amazon Simple Storage Service (Amazon S3). This service delivers a highly available object store. Amazon Elasticsearch Service. 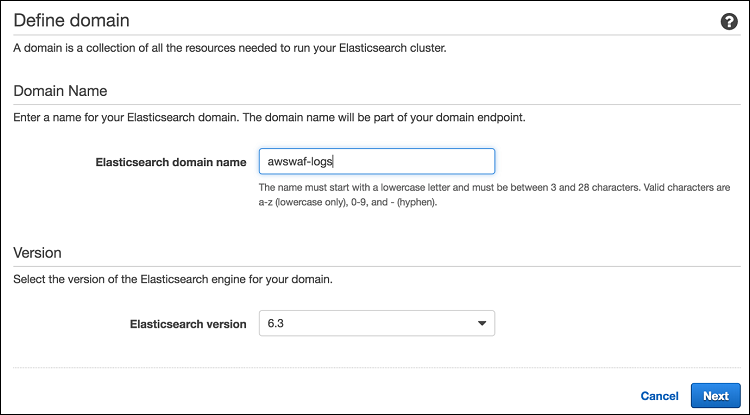 This service makes it easy to create a domain and deploy, operate, and scale Elasticsearch clusters in the AWS Cloud. Elasticsearch is a popular open-source search and analytics engine for use cases such as log analytics, real-time application monitoring, and clickstream analytics. Kibana is a popular open source visualization tool designed to work with Elasticsearch. 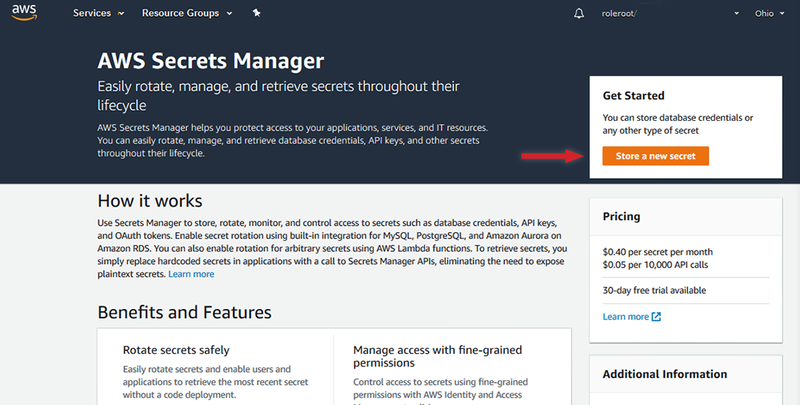 Amazon Cognito provides authentication services to offer user name and password protection for Kibana. The architectural diagram below illustrates the pipeline we’ll create. We’ll walk through the data flow to explain the architecture and highlight the additional customizations available to you. 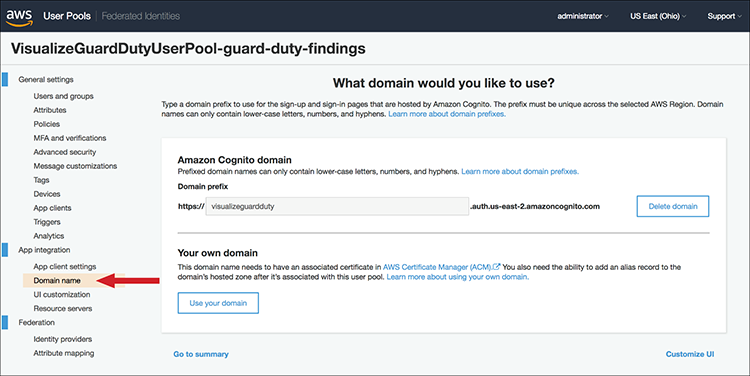 Amazon GuardDuty is enabled in an account and begins monitoring CloudTrail logs, VPC flow logs, and DNS query logs. If a threat is detected, GuardDuty forwards a finding to CloudWatch Events. For a newly generated finding, GuardDuty sends a notification based on its CloudWatch event within 5 minutes of the finding. CloudWatch Events allows you to send upstream notifications to various services filtered on your configured event patterns. We’ll configure an event pattern that only forwards events coming from the GuardDuty service. 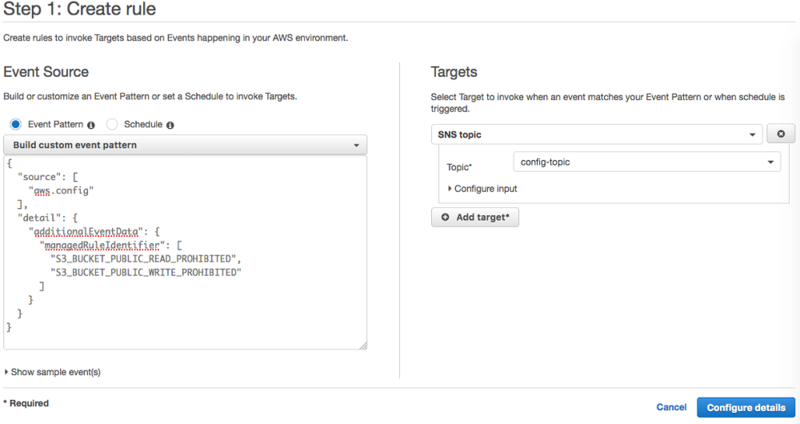 We define two targets in our CloudWatch Event Rule. 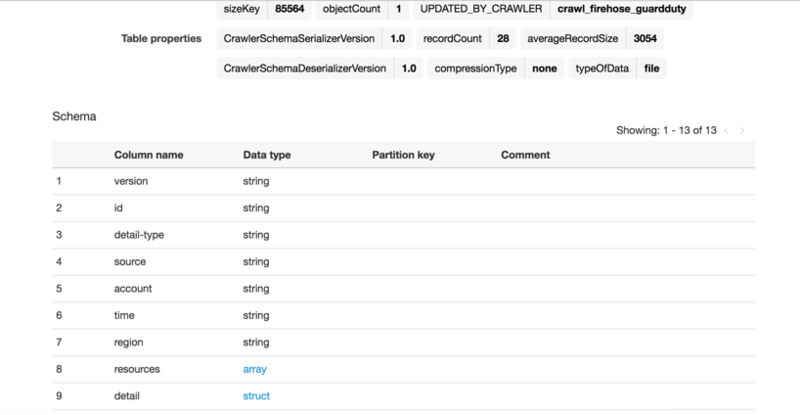 The first target is a Kinesis Firehose stream for delivery into an Elasticsearch domain and an S3 bucket. The second target is an SNS Topic for Email/SMS notification of findings. 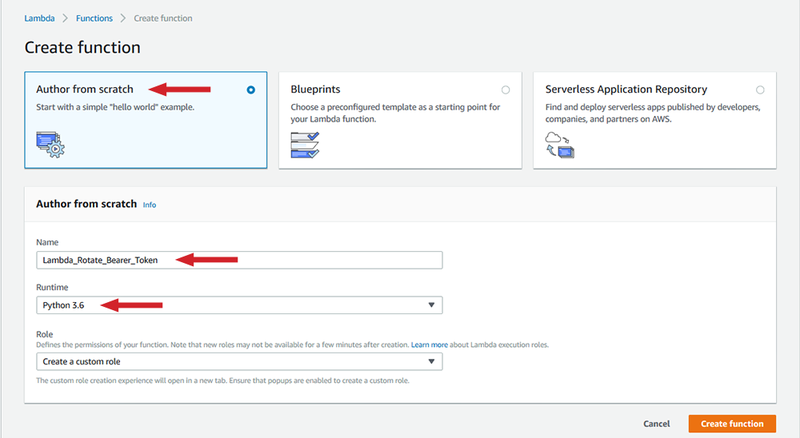 We’ll send all findings to our targets; however, you can filter and format the findings you send by using a Lambda function (or by event pattern matching with a CloudWatch Event Rule). For example, you could send only high-severity alarms (that is, findings with detail.severity > 7). 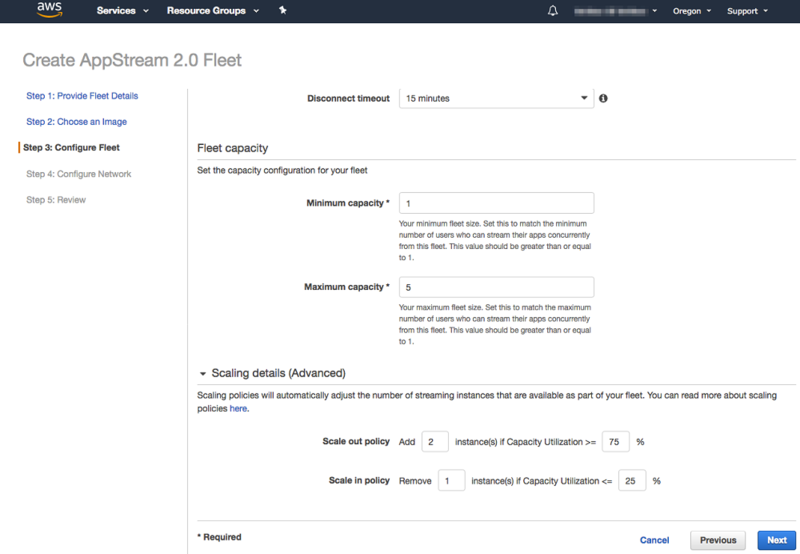 The Firehose stream delivers findings to Amazon Elasticsearch, which provides visualization and analysis for our event findings. The stream also delivers findings to an S3 bucket. 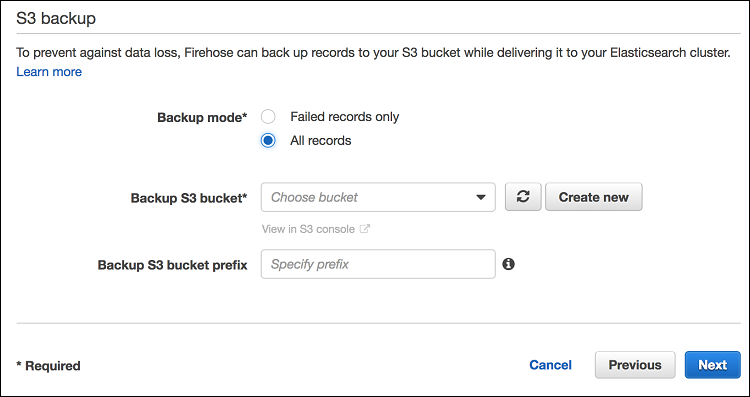 The S3 bucket is used for long term archiving. 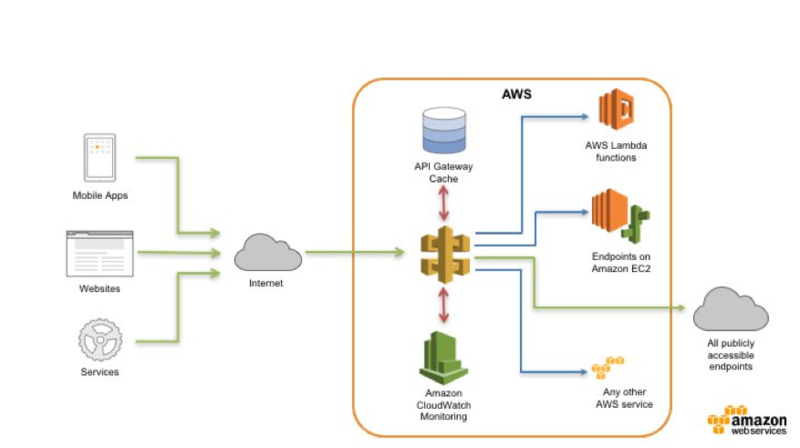 This data can augment your data lake and you can use services such as Amazon Athena to perform advanced analytics. 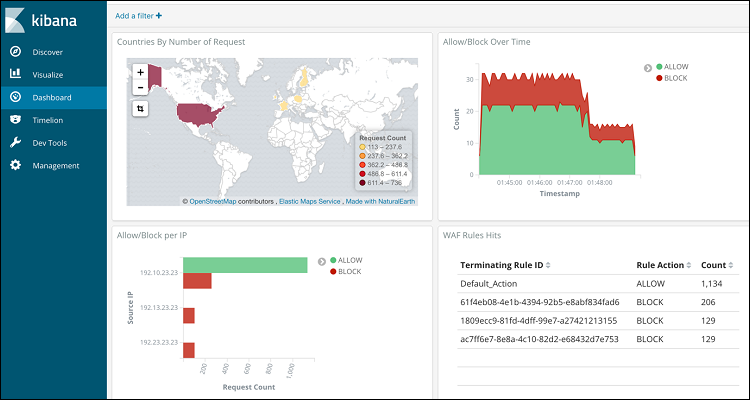 We’ll search, explore, and visualize the GuardDuty findings using Kibana and the Elasticsearch query Domain Specific Language (DSL) to gain valuable insights. Amazon Elasticsearch has a built-in Kibana plugin to visualize the data and perform operational analyses. 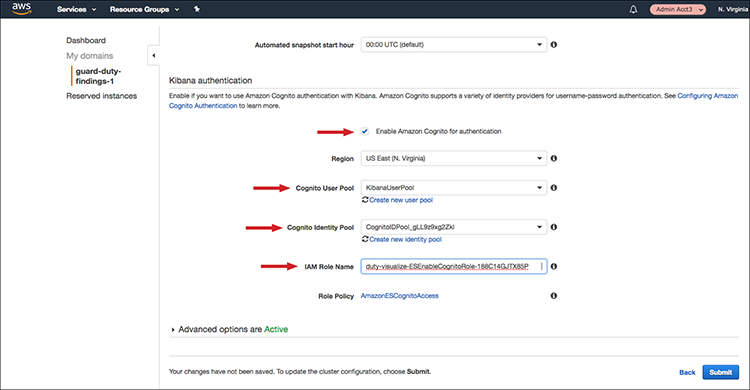 To provide a simplified and secure authentication method, we provide user authentication to Kibana with Amazon Cognito User Pools. This method provides improved security from traditional IP whitelists or proxy infrastructure. Our second CloudWatch Event target is SNS, which has subscribed email endpoint(s) that allow your operations teams to receive email (or SMS messages) when a new GuardDuty Event is received. 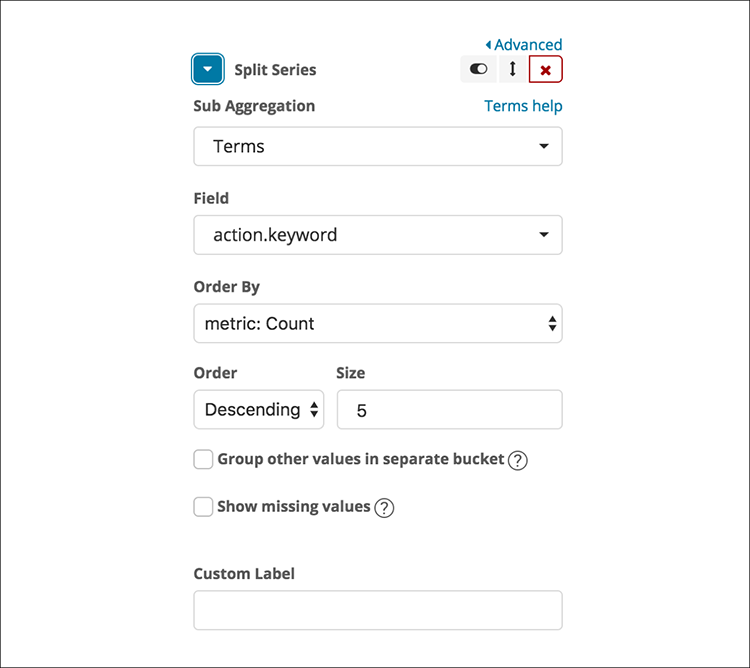 If you would like to centralize your findings from multiple regions into a single S3 bucket, you can adapt this pipeline. 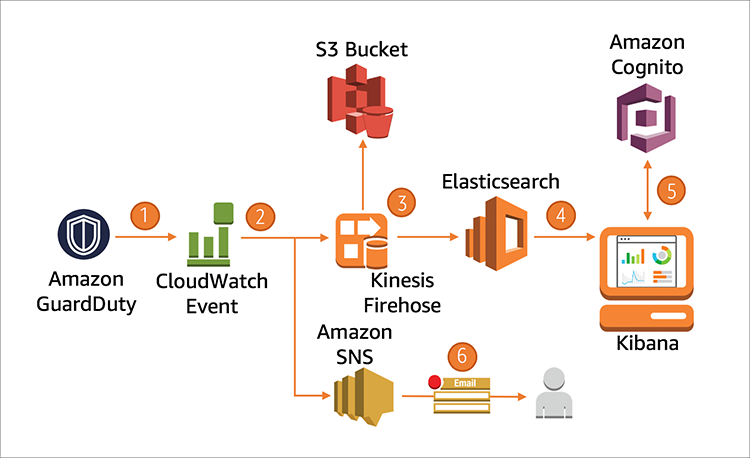 You would deploy the frontend of the pipeline by configuring Kinesis Firehose in the remote regions to point to the S3 bucket in the centralized region. You can leverage prefixes in the Kinesis Firehose configuration to identify the source region. For example, you would configure a prefix of us-west-1 for events originating from the us-west-1 region. 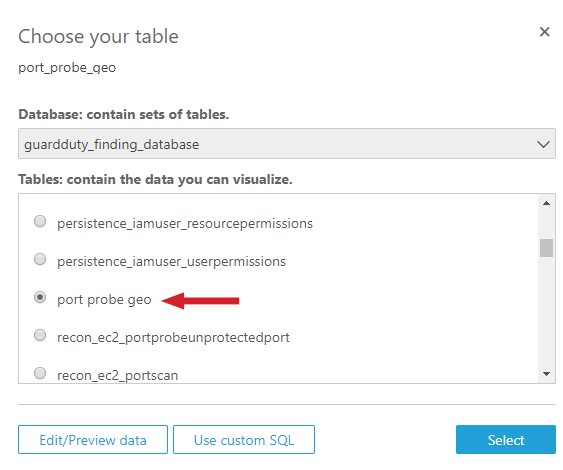 Analytic queries from tools such as Athena can then selectively target the desired region. EmailAddress — This email address is used to create a username in Cognito and a subscriber to the SNS topic. ESDomainName — This will be the name given to the Elasticsearch Domain. IndexName — This will be the Index created by Firehose to load data into Elasticsearch. Add Cognito authentication to Kibana, which is hosted on the Elasticsearch domain. At the time of writing, this can’t be done natively in CloudFormation. We’ll also confirm the SNS subscription so we can start to receive GuardDuty Findings via email. 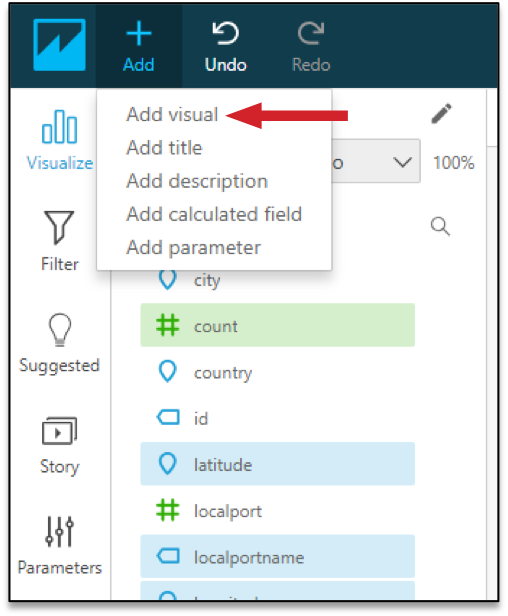 Configure Kibana with the index, the appropriate scripted fields, and the dashboard to provide the visualizations. We’ll also enable GuardDuty to start monitoring your account and send sample findings to test the pipeline. 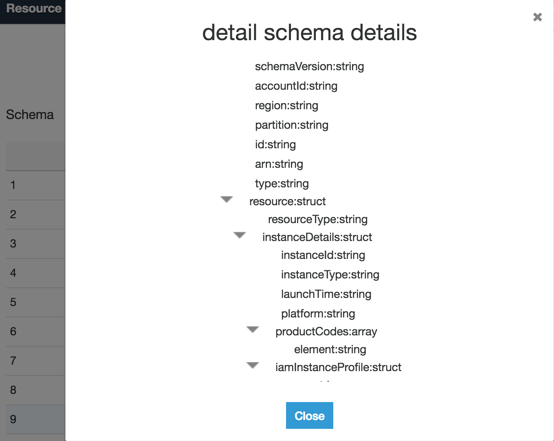 To enable user authentication to your dashboards hosted in Kibana, you need to enable the integration from the Elasticsearch domain that was created within the Cloudformation template. 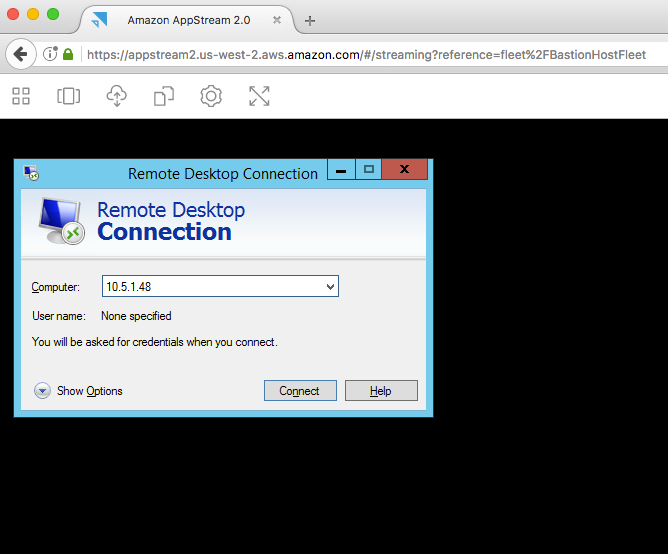 Open the AWS Console and select the Cognito service. 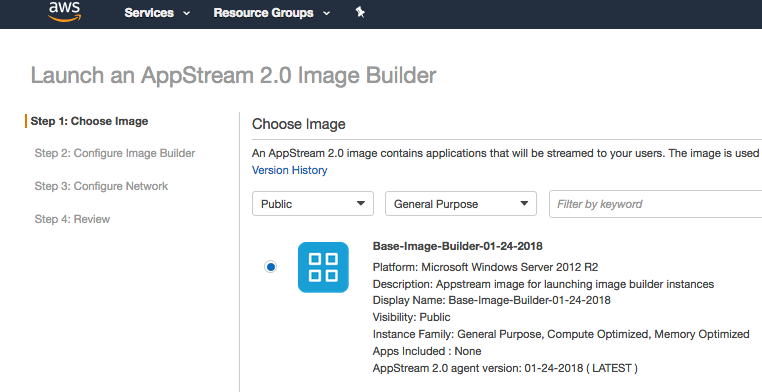 Select Manage User Pools to access the User Pool that was created in Cloudformation. 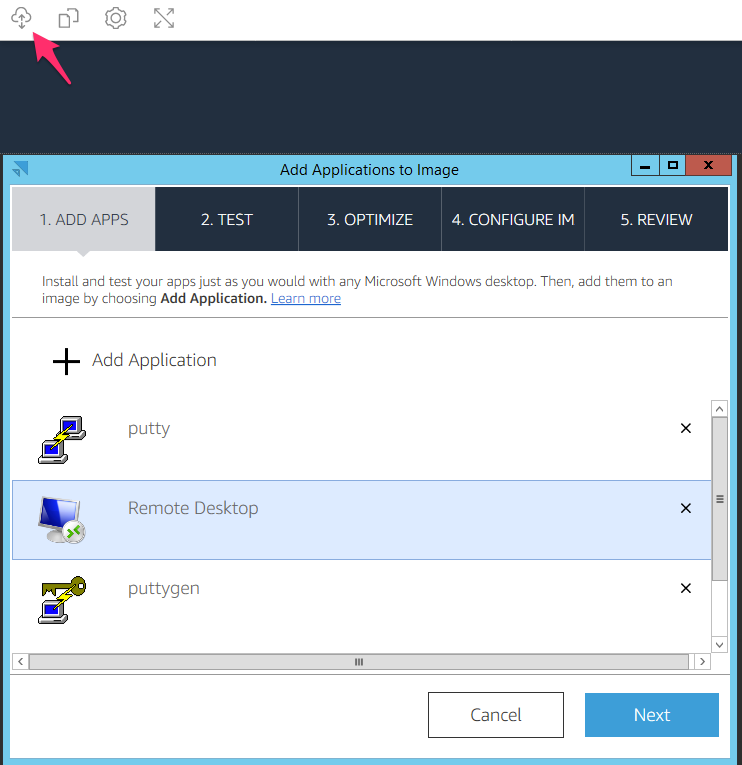 Select the user pool beginning with the name VisualizeGuardDutyUserPool and, under the App Integration menu item, select Domain name. You need to create a unique domain prefix to allow Kibana to authenticate using Cognito. Enter a unique domain prefix (it can only contain lowercase letters, numbers, and hyphens). After entering the prefix, select the Check Availability button to ensure it’s available in the region. If it’s available, select Save Changes button. 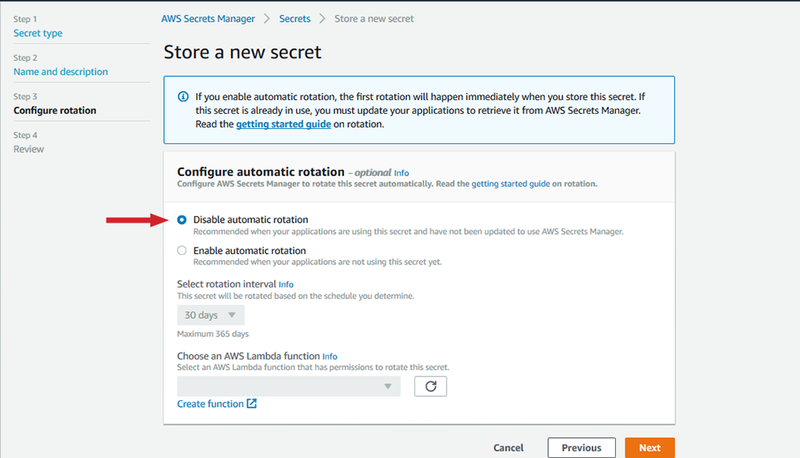 From the AWS Console, select the Cloudformation service. Select the template you created for your pipeline, select the Outputs tab, and then, under Value, copy the value of ESCognitoRole. 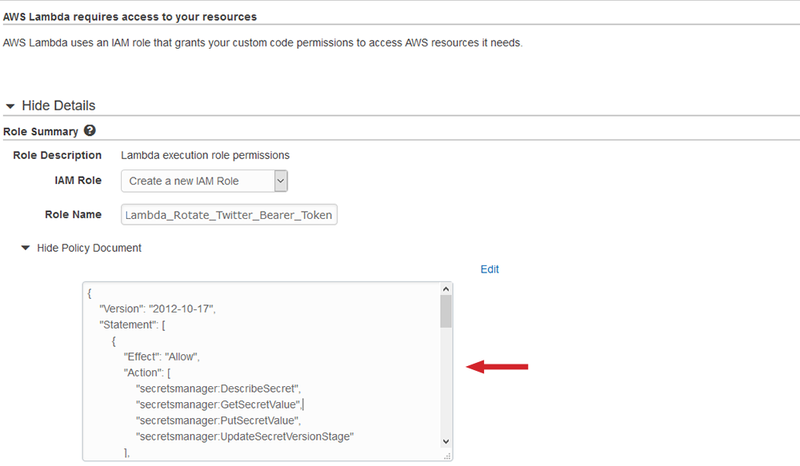 You’ll use this role when you enable Cognito authentication of Elasticsearch. 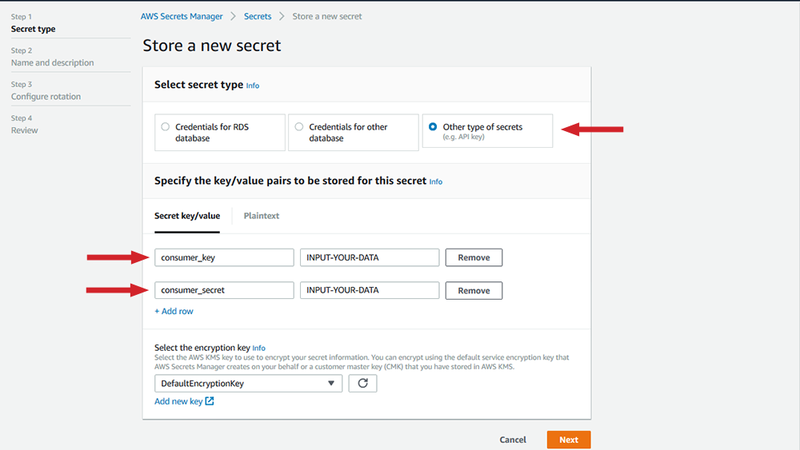 Under the Kibana authentication section, select the Enable Amazon Cognito for authentication checkbox. 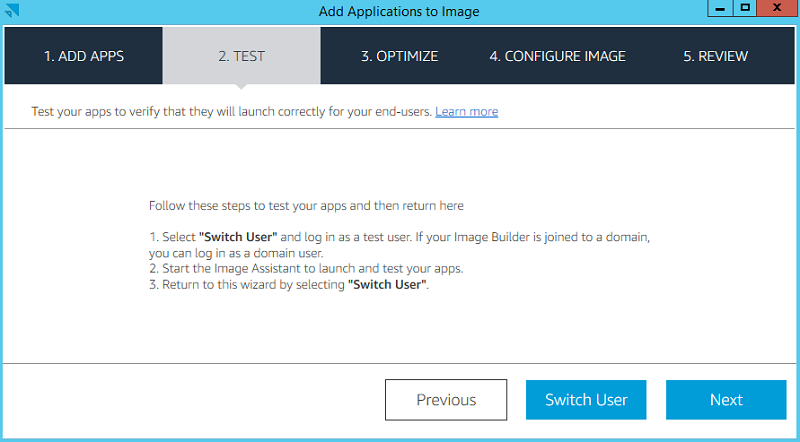 You’ll be presented with several fields you need to configure, including: Cognito User Pool (the name of the user pool should start with VisualizeGuardDutyUserPool), Cognito Identity Pool (the name of the identity pool should start with VisualizeGuardDutyIDPool), and IAM Role Name (this was copied in step 4 earlier). 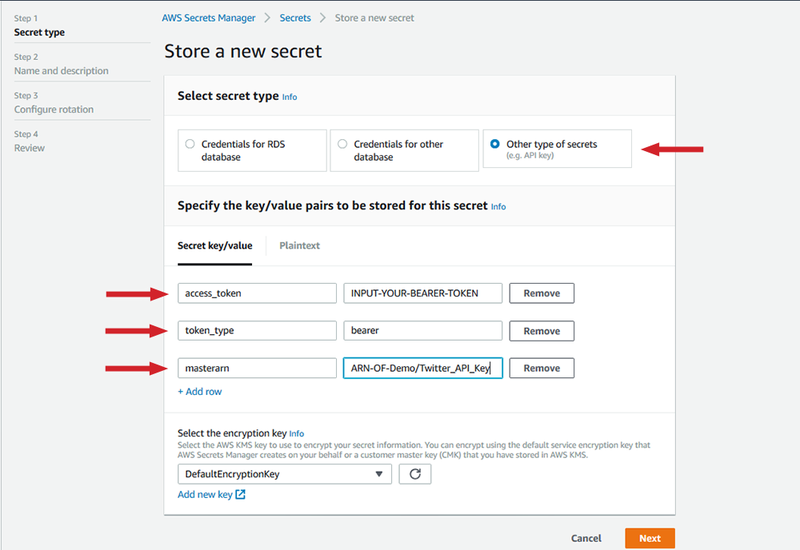 A Cognito User Pool is a user directory in Amazon Cognito, we use this to create a user account to provide authentication to Kibana. Amazon Cognito Identity Pools (federated identities) enable you to create unique identities for your users and federate them with identity providers. 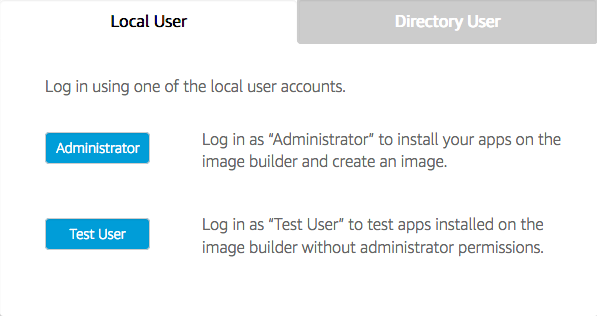 The Cognito Identity Pool in our case is used to provide federated access to Kibana. After you provided values for these fields, select the Submit button. The cluster reconfiguration will take several minutes to complete processing. When you see Domain status as Active, you can proceed. Finally, confirm the subscription email you received from SNS. 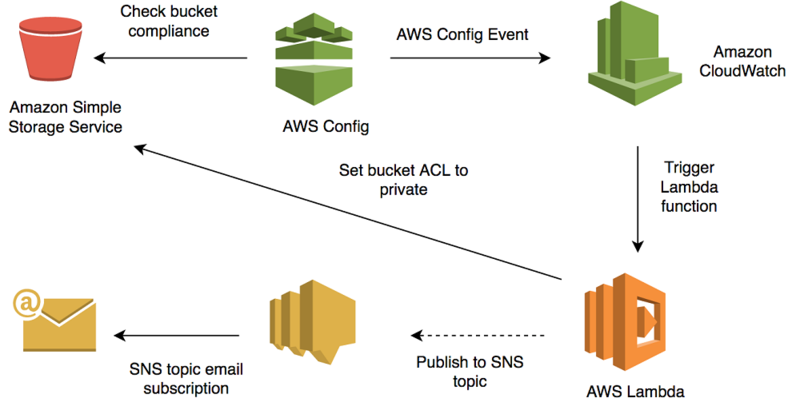 Look for an email from: AWS Notifications <[email protected]>, open the message and select Confirm subscription to allow SNS to send you email when the SNS Topic receives a notification for new GuardDuty findings. 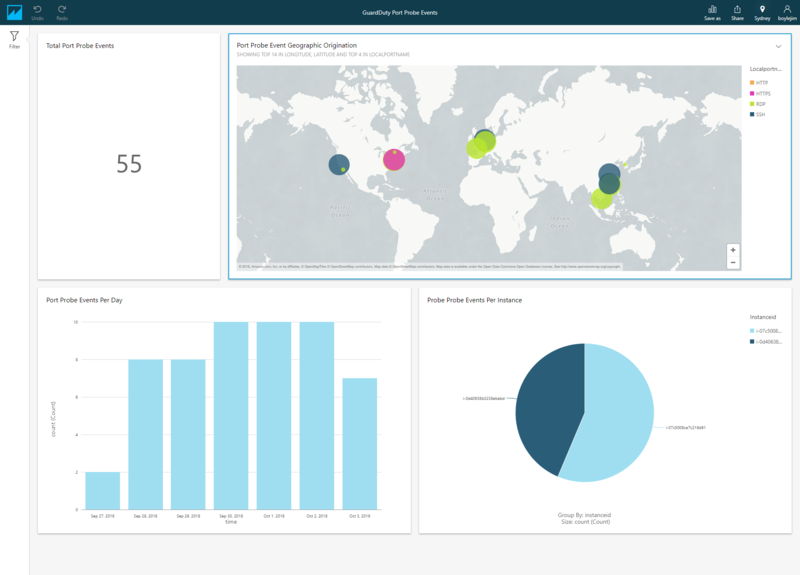 Now, you can set up the Kibana dashboard with custom visualizations. 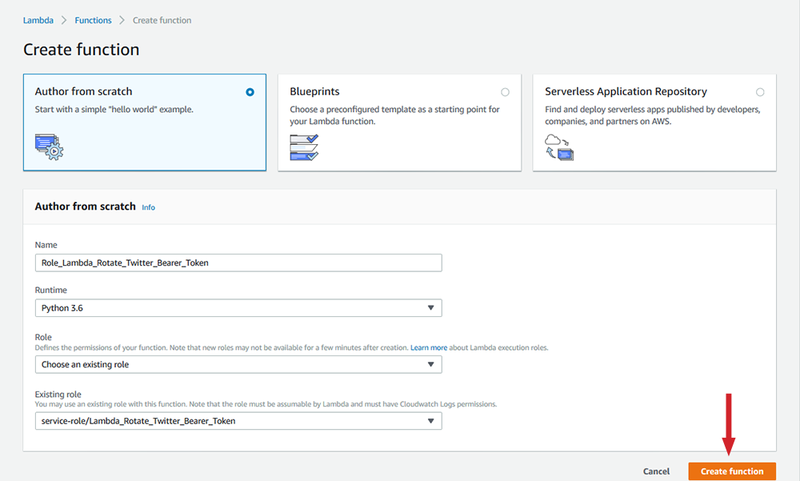 Open the CloudFormation service page and select the stack you created earlier. 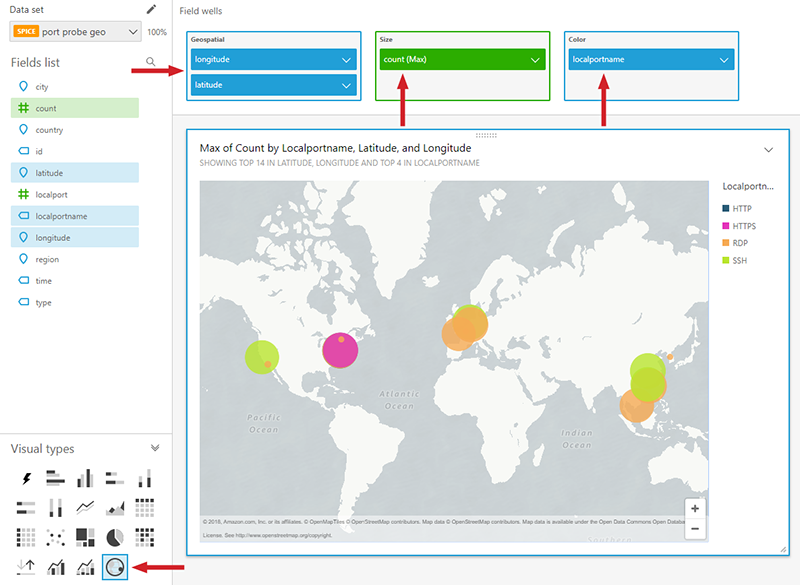 Under the Outputs section, copy the Kibana URL. Paste the Kibana URL in a new browser window. Check your email client. You should have an email containing the temporary password from Cognito. Copy the temporary password and use it to log in to Cognito. If you haven’t received the email, check your email junk folder. 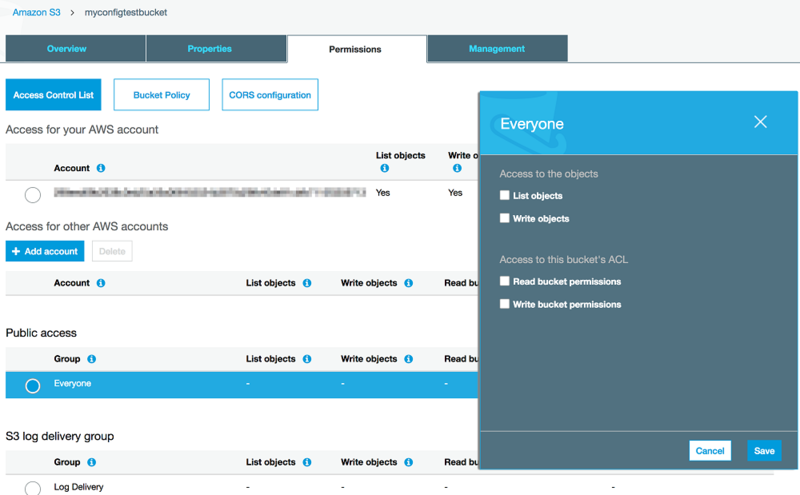 You can also create additional users in the Cognito User Pool that was created from the CloudFormation Stack to provide additional users Kibana access. 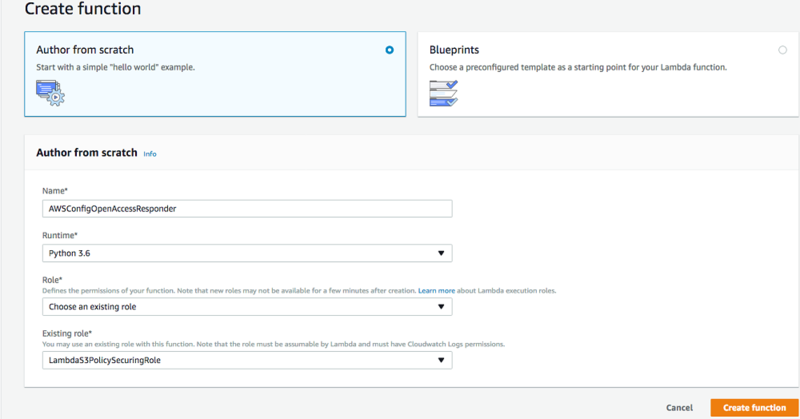 At the login prompt, enter the email address and password for the Cognito user the CloudFormation template created. A prompt to change your password will appear. Change your password to proceed. The Cognito User Pool requires: upper case letters, lower case letters, special characters, and numbers with a minimum length of 8 characters. After you paste the API call be sure to remove whitespace after the ending brace. This allows you to select the green arrow to execute it. You should receive a message that the call was successful. 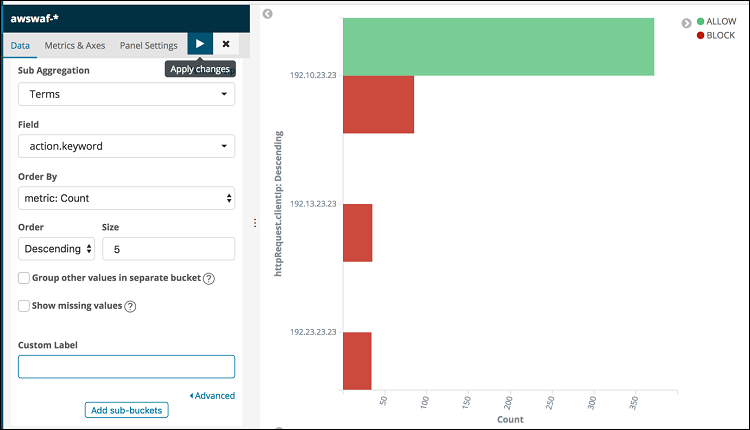 Next, enable GuardDuty and send sample findings so you can create the Kibana Dashboard with data present. 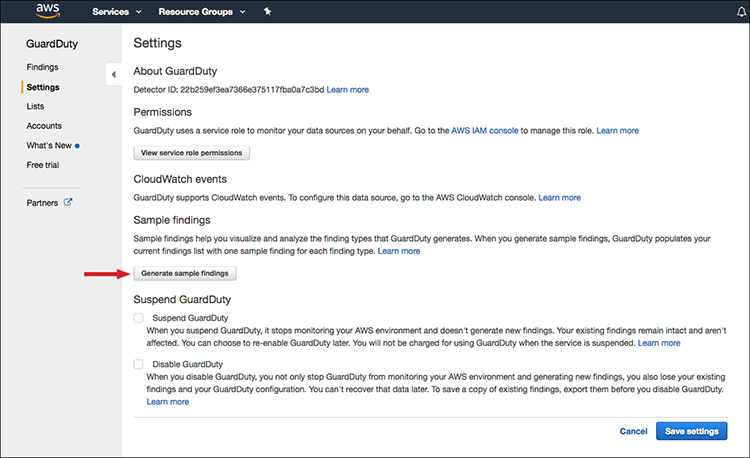 Find the GuardDuty service in the AWS Console and select the Get started button. From the Welcome to GuardDuty page, select the Enable GuardDuty button. 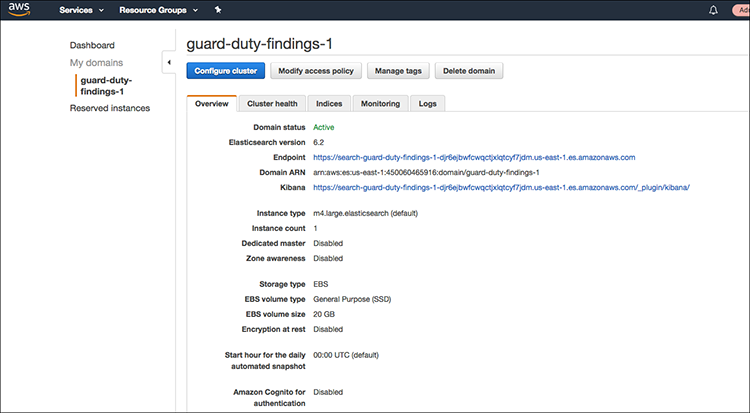 Optionally, if you want to test with real GuardDuty findings, you can leverage the Amazon GuardDuty Tester. 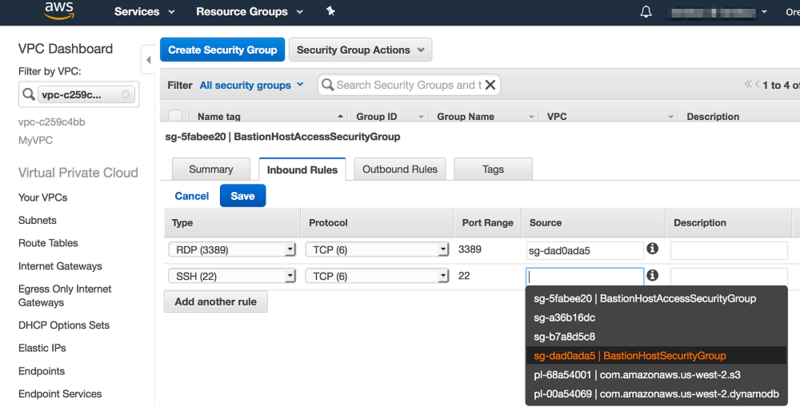 This AWS CloudFormation template creates an isolated environment with a bastion host, a tester EC2 instance, and two target EC2 instances to simulate five types of common attacks that GuardDuty is built to detect and notify you with generated findings. Once deployed, you would use the tester EC2 instance to execute a shell script to generate GuardDuty findings. Additional detail about this option can be found in the GuardDuty documentation. 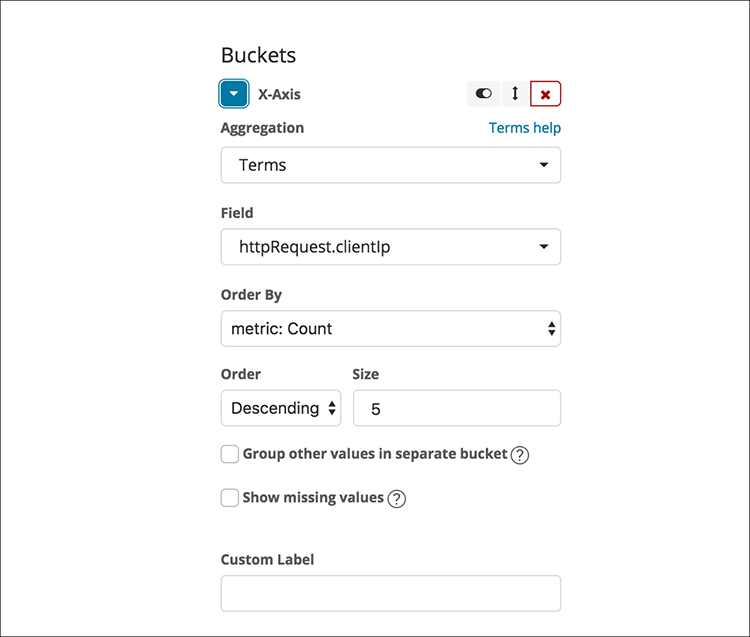 On the Kibana landing page, in the menu on the left side, create the Index by selecting Management. On the Management page, select Index Patterns. 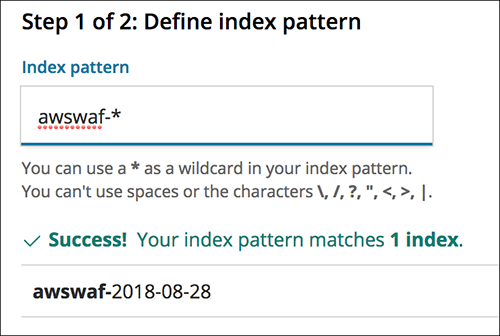 On the Create index pattern page, under Index patterns, enter gdt-* (if you used a different IndexName in the Cloudformation template, use that here), and then select Next Step. Note: It takes several minutes for the GuardDuty findings to generate a CloudWatch Event, work through the pipeline, and create the index in Elasticsearch. If the index doesn’t appear initially, please wait a few minutes and try again. Under Time Filter field name, select time from the drop-down list, and then select Create index pattern. With the Index defined, we will now create two scripted fields that your dashboard visualizations will use. Select the Index you just created, and then select scripted fields. After entering the information, select Create Field. The sevLevel field provides a value-to-level mapping as defined by GuardDuty Severity Levels. This allows you to visualize the severity levels in a more user-friendly format (High, Medium, and Low) instead of a cryptic numerical value. 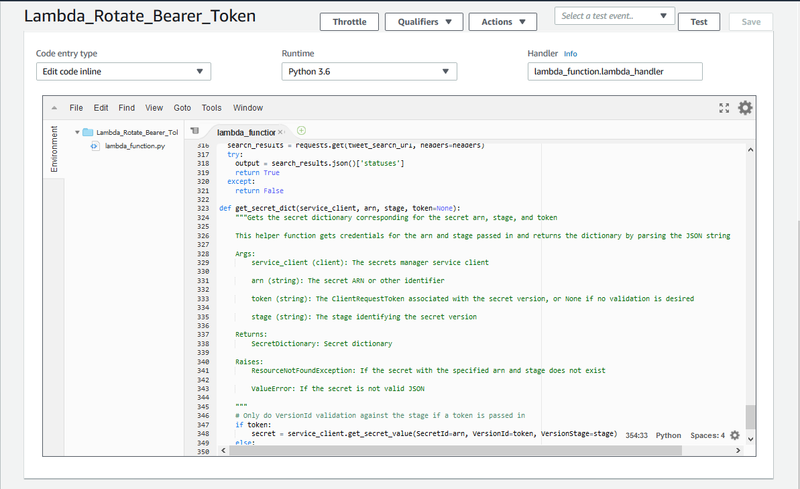 To generate sevLevel, we used Kibana painless scripting, which allows custom field creation. The typeCategory field is used to define the broad category “attack type.” The source field (detail.type.keyword) provides a lot of detailed information (for example: Recon:EC2/PortProbeUnprotectedPort), but we want to visualize the category of “attack type” in the high-level dashboard (that is, only Recon). We can still visualize on a more granular level, if necessary. 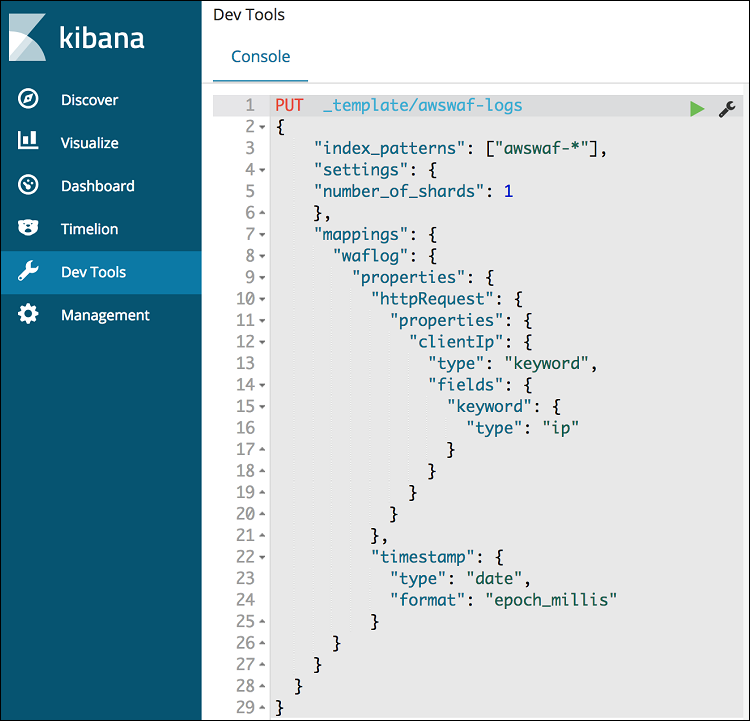 Create the Kibana dashboard by importing a JSON file containing its definition. 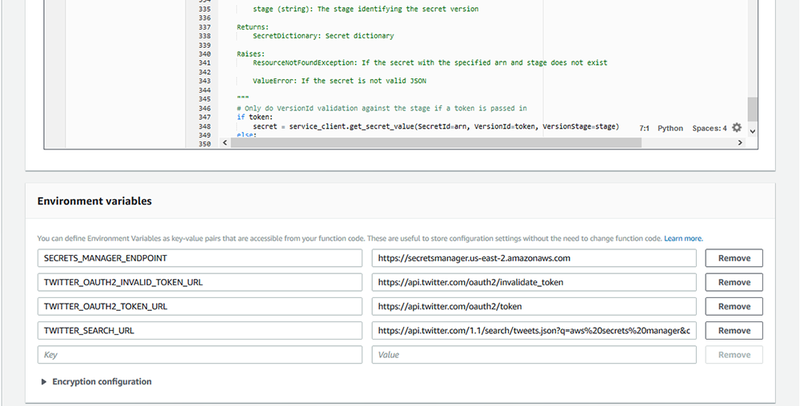 To do this, download the Kibana dashboard and visualizations definition JSON file from here. Select Management in the menu on the left, and then select Saved Objects. 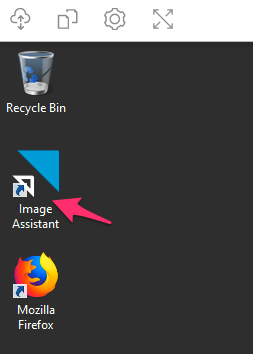 On the right, select Import. Select the JSON file you downloaded and select Open. This imports the GuardDuty dashboard and visualizations. Select Yes, overwrite all objects. In the Index Pattern Conflicts section, under New index pattern, select gdt-*, and then select Confirm all changes. Select Dashboard in the menu on the left. Select the Guard Duty Summary link. This filter allows you to filter sample findings from real findings. If you generate sample findings from the GuardDuty AWS console, this filter allows you to remove the sample findings from the dashboard. 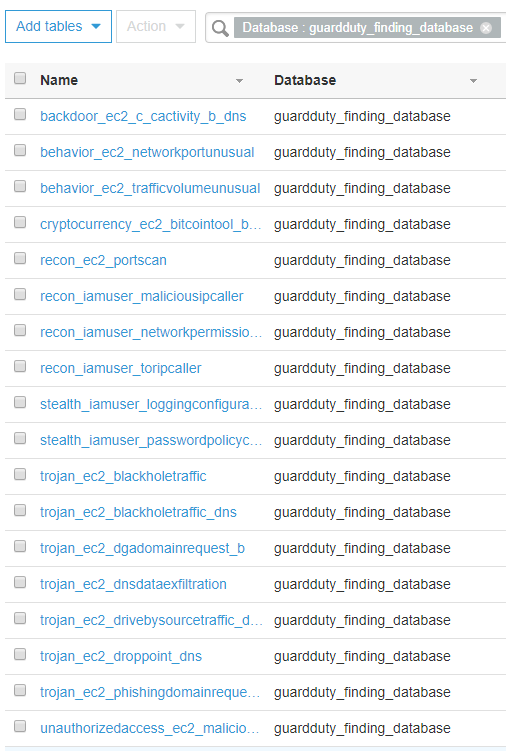 The GuardDuty — Affected Instances chart shows which EC2 instances have associated findings. This visualization allows you to filter specific instances from display by selecting them in the graphic. The Guard Duty — Threat Type chart allows you to filter on the general attack type (inner circle) as well as the specific attack type (outer circle). The Guard Duty — Events Per Day graph allows you to visualize and filter on a specific time or date to show findings for that specific time, as well as search for temporal patterns in findings. GuardDuty — Top10 Findings provides a list of the top 10 findings by count. GuardDuty — Total Events provides the total number of events based on the criteria chosen. This value will change based on the filters defined. The GuardDuty — Heatmap — Port Probe Source Countries visualizes the countries where port probes are issued from. This is a Coordinate Map visualization that allows you to see the source and volume of the port probes targeting your instances. The GuardDuty — Network Connection Source Countries visualizes where brute force attacks are coming from. This is a Region Map visualization that allows you to highlight the country the brute force attacks are sourced from. GuardDuty — Severity Levels is a pie chart that show findings by severity levels (High, Med, Low), and you can filter by a specific level (that is, only show high-severity findings). This visualization uses the scripted field we created earlier for simplified visualization. The All-GuardDuty table includes the raw findings for all events. This provides complete raw event detail and the ability to filter at very granular levels. 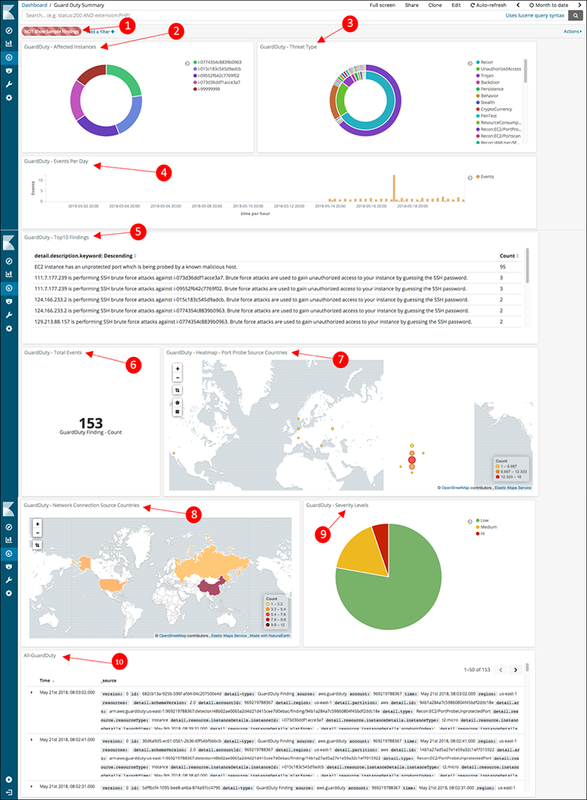 In a previous blog, we saw how you can create a Kibana dashboard to visualize your network security posture by visualizing your VPC flow logs. This GuardDuty dashboard augments that dashboard. You can use a single Elasticsearch cluster to host both of these dashboards, in addition to other data sources you want to analyze and report on. 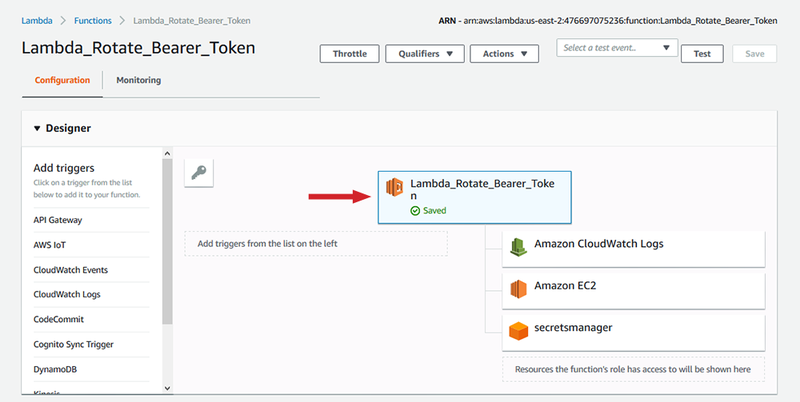 Extending the solution across AWS accounts or regions. If you have feedback about this blog post, submit comments in the Comments section below. If you have questions about this blog post, start a new thread on the Amazon GuardDuty forum. Michael is a Solutions Architect in AWS supporting enterprise customers and their journey to the cloud. Prior to his work on AWS and cloud technologies, Michael’s areas of focus included software-defined networking, security, collaboration, and virtualization technologies. He’s very excited to work as an SA because it allows him to dive deep on technology while helping customers. Ravi is a Senior Solutions Architect at AWS based in New York. He works with enterprise customers as they transform their business and journey to the cloud. He enjoys the culture of innovation at Amazon because it’s similar to his prior experiences building startup companies. Outside of work, Ravi enjoys spending time with his family, cooking, and watching the New Jersey Devils. On Tuesday, September 4, AWS announced the launch of an AWS Compliance Center for our Financial Services (FS) customers. This addition to our compliance offerings gives you a central location to research cloud-related regulatory requirements that impact the financial services industry. Prior to the launch of the AWS Compliance Center, customers preparing to adopt AWS for their FS workloads typically had to browse multiple in-depth sources to understand the expectations of regulatory agencies in each country. The AWS Compliance Center is designed to make this process easier. It aggregates any given country’s regulatory position regarding the adoption and operation of cloud services. Key components of the FS industry—including regulatory approvals, data privacy, and data protection—are explained, along with the steps you must take throughout your adoption of AWS services to help satisfy regulatory requirements. You can browse the information in the portal and export it as printable documents. We expect the AWS Compliance Center to evolve as our customers’ compliance needs change and as regulators begin to address the challenges and opportunities that cloud services create in the FS industry. The AWS Compliance Center covers 13 countries, and we’ll continue to enhance it with additional countries and information based on your needs. We have a new resource to help our financial services customers in Brazil navigate regulatory requirements for using the cloud. The AWS User Guide to Financial Services Regulations in Brazil is a deep dive into the Brazilian National Monetary Council’s Resolution No. 4,658. The cybersecurity cloud resolution is the first of its kind by regulators in Brazil. The guide details how our services may be able to assist you in achieving these security expectations. The resolution covers topics such as implementing a cybersecurity policy, incident response, entering into agreements with cloud service providers, subcontracting, business continuity, and notification requirements. Our guide addresses each of these issues and provides specific guidance on how you can use AWS to satisfy requirements. The AWS User Guide to Financial Services Regulations in Brazil is part of a series of publications that seek to facilitate customer compliance. It’s available in English and Portuguese. We’ll continue to monitor the regulatory environment in Brazil and around the world and to publish additional resources. At AWS, we focus on achieving security at scale to diminish risks to your business. Fundamental to this approach is ensuring your policies are configured in a way that helps protect your data, and the Automated Reasoning Group (ARG), an advanced innovation team at AWS, is using automated reasoning to do it. What is automated reasoning, you ask? It’s a method of formal verification that automatically generates and checks mathematical proofs which help to prove the correctness of systems; that is, fancy math that proves things are working as expected. If you want a deeper understanding of automated reasoning, check out this re:Invent session. 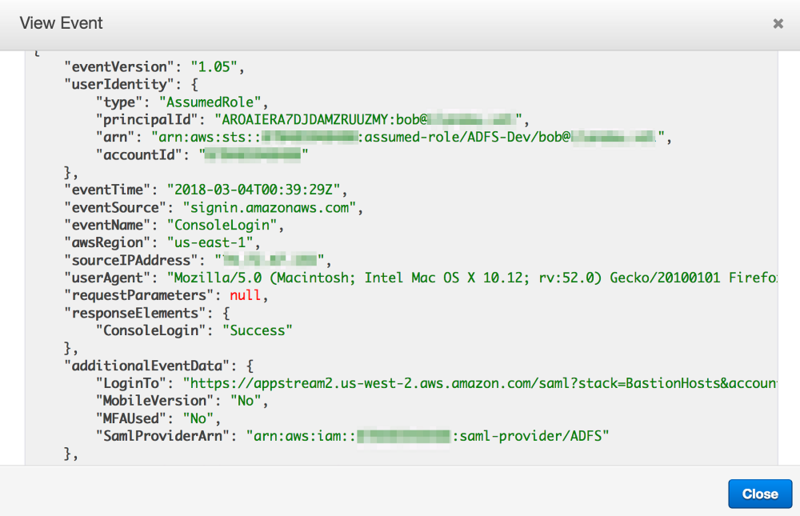 While the applications of this methodology are vast, in this post I’ll explore one specific aspect: analyzing policies using an internal Amazon service named Zelkova. What is Zelkova? How will it help me? Zelkova uses automated reasoning to analyze policies and the future consequences of policies. This includes AWS Identity and Access Management (IAM) policies, Amazon Simple Storage Service (S3) policies, and other resource policies. These policies dictate who can (or can’t) do what to which resources. Because Zelkova uses automated reasoning, you no longer need to think about what questions you need to ask about your policies. Using fancy math, as mentioned above, Zelkova will automatically derive the questions and answers you need to be asking about your policies, improving confidence in your security configuration(s). Zelkova translates policies into precise mathematical language and then uses automated reasoning tools to check properties of the policies. These tools include automated reasoners called Satisfiability Modulo Theories (SMT) solvers, which use a mix of numbers, strings, regular expressions, dates, and IP addresses to prove and disprove logical formulas. Zelkova has a deep understanding of the semantics of the IAM policy language and builds upon a solid mathematical foundation. While tools like the IAM Policy Simulator let you test individual requests, Zelkova is able to use mathematics to talk about all possible requests. Other techniques guess and check, but Zelkova knows. 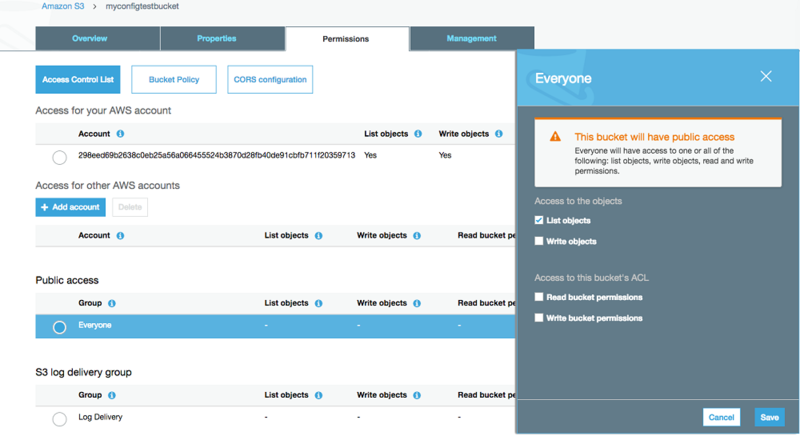 S3 uses Zelkova to check each bucket policy and warns you if an unauthorized user is able to read or write to your bucket. When a bucket is flagged as “Public”, there are some public requests that are allowed to access the bucket. However, when a bucket is flagged as “Not public”, all public requests are denied. Zelkova is able to make such statements because it has a precise mathematical representation of IAM policies. In fact, it creates a formula for each policy and proves a theorem about that formula. Unfortunately, this policy statement does not capture my intentions. Instead, it allows access for everybody in the world who is not the given principal. This means almost everybody now has access to my bucket, including anonymous unauthorized users. Fortunately, as soon as I attach this policy, S3 flags my bucket as “Public”—warning me that there’s something wrong with the policy I wrote. How did it know? Here, is the mathematical symbol for “and” which is true only when both its left and right side are true. Resource and Principal are variables just like you would use x and y in algebra class. The above formula is true exactly when my policy allows a request. The precise meaning of my policy has now been defined in the universal language of mathematics. The next step is to decide if this policy formula allows public access, but this is a hard problem. Now Zelkova really goes to work. A counterintuitive trick sometimes used by mathematicians is to make a problem harder in order to make finding a solution easier. That is, solving a more difficult problem can sometimes lead to a simpler solution. In this case, Zelkova solves the harder problem of comparing two policies against each other to decide which is more permissive. If P1 and P2 are policy formulas, then suppose formula P1 ⇒ P2 is true. This arrow symbol is an implication that means whenever P1 is true, P2 must also be true. So, whenever policy 1 accepts a request, policy 2 must also accept the request. Thus, policy 2 is at least as permissive as policy 1. Suppose also that the converse formula P2 ⇒ P1 is not true. That means there’s a request which makes P2 true and P1 false. This request is allowed by policy 2 and is denied by policy 1. Combining all these results, policy 1 is strictly less permissive than policy 2. How does this solve the “Public / Not public” problem? Zelkova has a special policy that allows anonymous, unauthorized users to access an S3 resource. It compares your policy against this policy. If your policy is more permissive, then Zelkova says your policy allows public access. 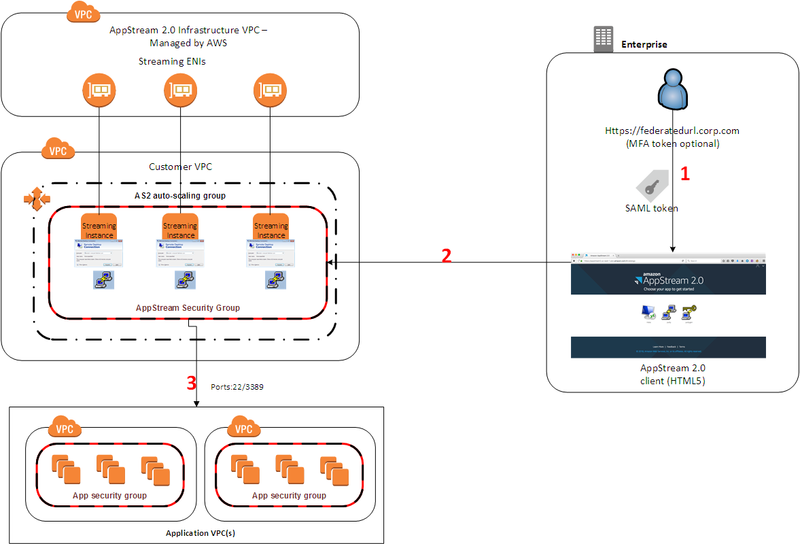 If you restrict access—for example, based on source VPC endpoint (aws:SourceVpce) or source IP address (aws:SourceIp)—then your policy is not more permissive than the special policy, and Zelkova says your policy does not allow public access. For all this to work, Zelkova uses SMT solvers. Using mathematical language, these tools take a formula and either prove it is true for all possible values of the variables, or they return a counterexample that makes the formula false. The SMT solver will now respond that the formula is true for all values of the variables a and b. Here, the solver has combined reasoning about strings (length, append) with reasoning about numbers (greater-than-or-equal-to). SMT solvers are designed for exactly this sort of theory composition. With this policy statement attached, S3 correctly reports my bucket as “Not public”. Zelkova has translated this policy into a mathematical formula, compared it against a special policy, and proved that my policy is less permissive. Fancy math has proved that things are working (or in this case, not working) as expected. Where else is Zelkova being used? 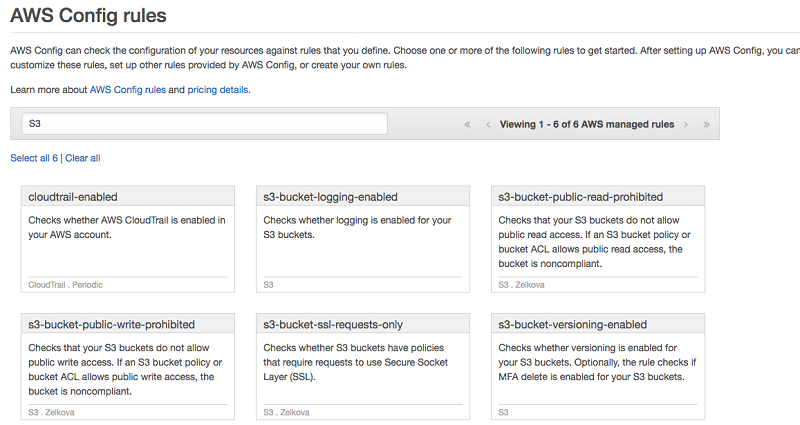 AWS Config continuously audits AWS resource configurations and now includes Zelkova-based managed rules such as s3-bucket-public-read-prohibited, s3-bucket-public-write-prohibited, s3-bucket-server-side-encryption-enabled, s3-bucket-ssl-requests-only, and lambda-function-public-access-prohibited. AWS Trusted Advisor helps improve the security of your AWS environment, including analyzing resource policies. Amazon Macie uses machine learning to automatically discover, classify, and protect sensitive data in AWS. It uses Zelkova to determine the accessibility of S3 buckets. 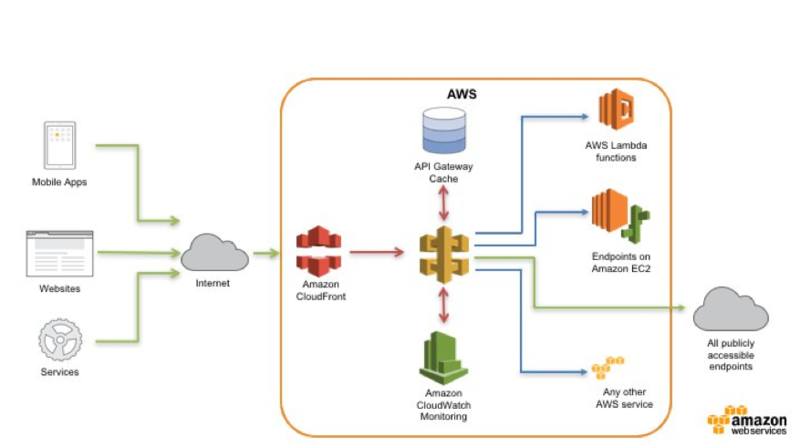 Amazon GuardDuty is a managed threat detection service that uses Zelkova. 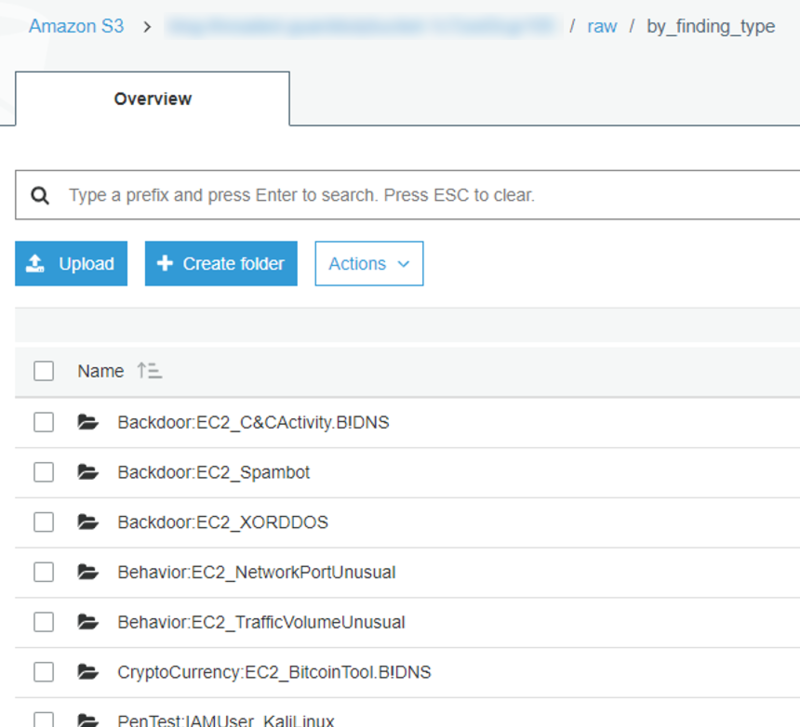 AWS services such as S3 use Zelkova to precisely represent policies and prove that they are secure—improving confidence in your security configurations. Zelkova can make broad statements about all resource requests because it’s based on mathematics and proofs instead of heuristics, pattern matching, or simulation. The ubiquity of policies in AWS means that the value of Zelkova and its benefits will continue to grow as it serves to protect more customers every day.